I saw this sign recently at some but not all entrances to a wood in Wicklow. It is news to me that walkers are expected to stay on "designated trails or forest roads" for 6 months a year in some forests. Consider a typical current scenario for both club walkers and solitary or small group walkers. You come down into a forest in near dark through a ride, nowhere near any signs. You haven't been warned and you aren't aware that shooters may be operating. The shooters meanwhile have as far as they know complied with rules about signs at entrances and are busy stalking deer, thinking that walkers will stick to tracks. Suddenly we have shooters and walkers loose in the same poorly lit space. This is a dangerous situation. 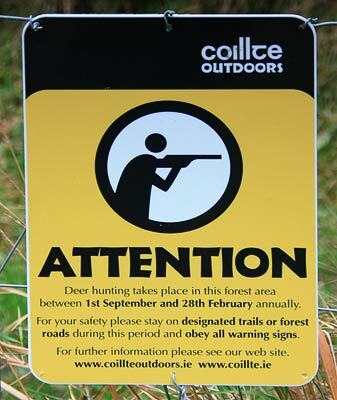 While I would appreciate that Coillte are trying to manage the issue and trying to deal with unlicensed shooters, nevertheless there seems to me to be some serious loose ends exposed. Wicklore's useful comments shed some light on the issue and I have sought further information such as a list of forests that licences have been issued in from Coillte. It may or may not be an issue that will become a serious problem. We could use further examples from people, particularly of encounters with shooters. Certainly I can remember being on a Wayfarer walk that did descend into a forest in the near dark and did encounter a couple of hunters with a shot deer so this is not some abstract "can't happen" sort of situation.